The Albatros D.II was almost identical to the original Albatros D.I designed by Robert Thelen, the changes were a lowered main-plane positioned slightly further forward and "N" style cabane struts, this had virtually no effect on the aircraft's performance but gave the pilot a less obstructed forward and upward view. The Albatros D.II was introduced into active service in September 1916 and soon "won back" air superiority from the Allies, by the time it's replacement, the Albatros D.III, came into service in December 1916 by which time a total of 291 Albatros D.II fighter aircraft had been produced. Early examples of the Albatros D.II had radiators fitted to the side of the fuselage below the engines cooling system, these were susceptible to battle damage, and if holed would drain away the cooling water very quickly. In later aircraft an aerofoil sectioned radiator was fitted on the upper wing, it holed it lost waster at a lower rate but any boiling water that did leak out tended to badly scald the pilots face. 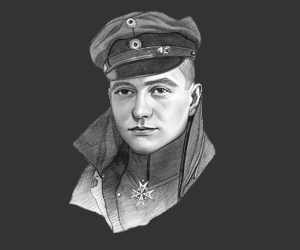 It is of note that Manfred von Richthofen (The Red Baron) was flying an Albatros D.II when he shot down the British flying ace Lanoe Hawker in his Airco DH.2 fighter on the 23rd of November 1916. This picture of Albatros D.II is Copyright © June 2014 Siteseen Ltd. We only authorise non-commercial picture use and particularly encourage their use for educational purposes. This Albatros D.II picture is not in the Public Domain. 3) Use of this Albatros D.II picture, or any of our pictures on websites re-distributing copyright free material is strictly prohibited.